This is a stunning three bedroom apartment which is immaculately presented, located within a desirable apartment block in the heart of the City. 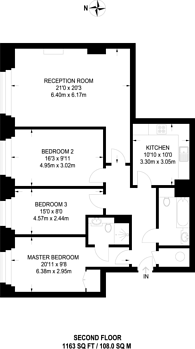 Offered with high-specification fixtures and fittings throughout. Tudor Street is situated in the heart of the City of London, and is a short distance from Blackfriars Station (London Underground and ThamesLink). Nearby Fleet Street hosts a great selection of amenities to cater to all tastes. We have over 1,000 property market reports for locations across London and Surrey - including EC4 and Blackfriars.